Not to be confused with Chongqing, China. 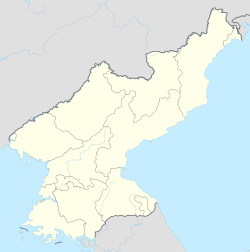 Chŏngjin (Korean pronunciation: [tsʰʌŋ.dʑin]; Chosŏn'gŭl: 청진시; MR: Ch'ŏngjin-si) is the capital of North Korea's North Hamgyong Province and the country's third largest city. It is sometimes called the City of Iron. Downtown Chongjin in September 2011, as seen from the city's monument of Kim Il-sung. Chongjin was a small fishing village prior to the Japanese annexation of Korea; its date of establishment is unknown. The Chinese characters for its name mean 'clear river crossing'. During the Russo-Japanese War of 1904-1905, Japanese forces landed at Chongjin, and established a supply base due to its proximity to the front lines in Manchuria. The Japanese remained after the end of the war, and in 1908, declared the city an open trading port both for transport of Korean resources and as a stopping point for resources from China. The city was known during this period as “Seishin”, after the Japanese pronunciation of the Chinese characters for its name. The Imperial Japanese Army’s 19th Division was headquartered in Ranam from 1918, where the Japanese built a new planned city based on a rectangular street grid. In the 1930, Nippon Steel built a large steel mill, the Seishin Iron and Steel Works, in the town. Ranam was annexed to Chongjin in 1940, which was elevated to city status. The city was overrun after a brief resistance by the Soviet Union on 13 August 1945, only two days before the end of World War II. Under the rule of North Korea, Chongjin remained an important military and industrial centre. It was directly administered by the central government from 1960-1967 and from 1977-1988. During the North Korean famine of the 1990s, Chongjin was one of the worst affected locations in the country; death rates may have been as high as 20 %. Conditions there remain poor in terms of food availability. This problem has caused several instances of civil unrest in Chongjin, a rarity in North Korea. On 4 March 2008, a crowd of women merchants protested in response to tightened market controls. Rising grain prices and government attempts to prohibit "peddling in the market" have been cited as causes for the protests. As a result of the protest, the Chongjin local government "posted a proclamation allowing peddling in the market." On 24 August 2008, a clash occurred between foot patrol agents and female merchants, which escalated into a "massive protest rally". It was reported that the Chongjin local government issued verbal instructions relaxing the enforcement activity until the time of the next grain ration. From 1948 to 1960, 1967 to 1977, and 1987 to present, Ch'ŏngjin was governed as a part of North Hamgyong Province. From 1960 until 1967, and again from 1977 to 1987, Chongjin was administered as a directly governed city. Ch'ŏngjin is divided into 7 wards (구역, kuyŏk, Korean pronunciation: [kujʌk]). Chongjin is located in the northeast of North Korea, in North Hamgyong Province, near the East Korea Bay (Kyŏngsŏng Bay) in the Sea of Japan. The Sosong River runs through the city; contained in the city are the Sonam Stream and Mount Komal. Chongjin has a humid continental climate (Köppen climate classification: Dwb) with cold, dry winters and very warm, rainy summers. Chongjin is one of the DPRK’s important steel and fiber industry centers. It has a shipyard, locomotive plant, and a rubber factory. Near the port area are the Chongjin Steel Co., Chemical Textile Co., May 10 Coal Mine Machinery Factory, and Kimchaek Iron & Steel (which was called Nippon Steel during the Japanese occupation); however industrial activities in the city have been severely handicapped due to a lack of resources. Despite this however, Chongjin is estimated to have a 24 per cent share of the DPRK's foreign trade and is home to a resident Chinese consul who serves Chinese merchants and businesspersons operating in the north east of the country. Chongjin also contains Sunam Market, an example of market economics in North Korea. Because of the heavy concentration of industries in the area, Chongjin is also the DPRK's air pollution black spot. With the collapse of the Soviet Union and the subsequent shortage of oil to generate electricity, many factories have been shuttered. One of the first senior U.N. officials permitted to visit the area, Tun Myat, observed in 1997 when the North Korea economic crisis reached its peak, "Chongjin was like a forest of scrap metal, with huge plants that seem to go on for miles and miles that have been turned into rust buckets. I've been all over the world, and I've never seen anything quite like this." The area has little arable land, so the famine in the 1990s hit the residents of Chongjin particularly hard. During the late 1990s, the city's residents experienced some of the highest death rates from famine, which might have been as high as 20 percent of the population. By 1995, the local frog population was wiped out due to overhunting. In Chongjin political prison camp (Kwan-li-so No. 25), a large prison complex in Susong-dong (northern part of Chongjin), more than 3,000 political prisoners are forced to manufacture bicycles and other consumer goods. Chongori reeducation camp (Kyo-hwa-so No. 12) is located halfway between Chongjin and Hoeryong. The Nongpo Detention Center, which was built during the Japanese occupation, is still in use but under new management. Chongjin's port has established itself as a critical component of busy international shipping trade with neighbouring parts of Northeast and Southeast Asia. Of DPRK's eight international shipping ports, Chongjin is thought to be second most economically important (after Nampho port on the west coast) and serves as a base of trade to Russia and Japan. Chongjin also boasts a seamen's club which serves to cater for foreign crews as well as a meeting base for North Koreans and foreigners engaged in the shipping trade. The People's Republic of China and Russia have set up their consulates in Chongjin. It is unique for a North Korean city to have a foreign consulate. Chongjin is the administrative centre of the North Hamgyong Province. Chongjin Airport is equipped with a 2,000 m (6,600 ft) runway on a military and civilian dual purpose air station (CHO). North Korea planned to upgrade an old airport near Hamhung as late as 2003, so that it would have a 4,000 m (13,000 ft) runway, and would act as the nation's second international airport. However, it is still not completed. The Wonson-Rason Railway and Chongjin-Rason Railway (Pyongra Line) electric railways operated by the Korean State Railway connect Rason and capital Pyongyang. Chongjin is the only city in North Korea other than Pyongyang to operate a tram system. These trains are all second-hand from Pyongyang. Originally, it was planned to be a 32 km (20 mi) system, but only phase 1, 6 km (3.7 mi), and phase 2, 7 km (4.3 mi), were completed. Phase 3, which was to be 8 km (5.0 mi), was not completed due to lack of funds. Also, due to electricity shortages, the trams run infrequently. Besides trams, trolley buses also operate, but these are operated only two hours a day. Private taxis do not exist. The main and only road, called Road No. 1, is a six lane highway that intersects the city. The Kim Jong-suk Teachers' College, which was named after Kim Jong-il's mother, Kim Jong-suk, is in Chongjin. There is an aquatic product research center. Famous scenic sites include hot springs and Mt. Chilbo. It has a zoo with no animals in it. Chongjin's most famous product is processed squid. The city is home to the football team, the Ch'ŏngjin Chandongcha. The local newspaper is the Hambuk Daily. Chongjin is featured in the book Nothing to Envy: Ordinary Lives in North Korea by Barbara Demick. Chonmasan Hotel for foreign visitors to stay at, built to convey the power of the government over the individual; in 1997, a French aid worker from Action contre la Faim was allowed to stay there but was not let out of the hotel to observe the famine conditions. Hamgyeongbuk Provincial Office during Korea under Japanese rule's period. ^ a b c d e f g h i j k l m n o p Demick, Barbara (2010). Nothing to Envy: Real Lives in North Korea (UK ed.). Granta Publications. ISBN 978-1-84708-141-4. ^ "Woolverton Inn - Ceremony - North Korea's Geography & Major cities - A Map viewing major cities and the capital of North Korea. Highlighting important geographical locations and points of interest. One in particular being the 38th parallel". www.communitywalk.com. ^ "Chongjin". Encyclopaeida Britannica’s. Retrieved 8 December 2012. ^ a b Smith, Hazel (2009).North Korean Shipping:A Potential for WMD Proliferation?, Asia Pacific Issues. No. 87. Retrieved on 2010-12-28. ^ Demick, Barbara (2010). Nothing to Envy. Real Lives in North Korea. W11 4QR London, UK: Granta Publications. p. 145. ISBN 978-1-84708-141-4. ^ "KINU White paper on human rights in North Korea 2009 (Chapter G. Human Rights Violations Inside Political Concentration Camps (Kwanliso), page 125)" (PDF). ^ Asia Trade Hub, http://www.asiatradehub.com/n.korea/ports.asp Archived 2016-03-29 at the Wayback Machine. ^ "Chongjin（D.P.R.K.）". Changchun Municipal People's Government. Retrieved 22 October 2017. ^ "Chongjin（D.P.R.K.）". People's Government of Jilin. 12 April 2011. Retrieved 22 October 2017. Wikimedia Commons has media related to Chongjin. Wikivoyage has a travel guide for Chongjin.